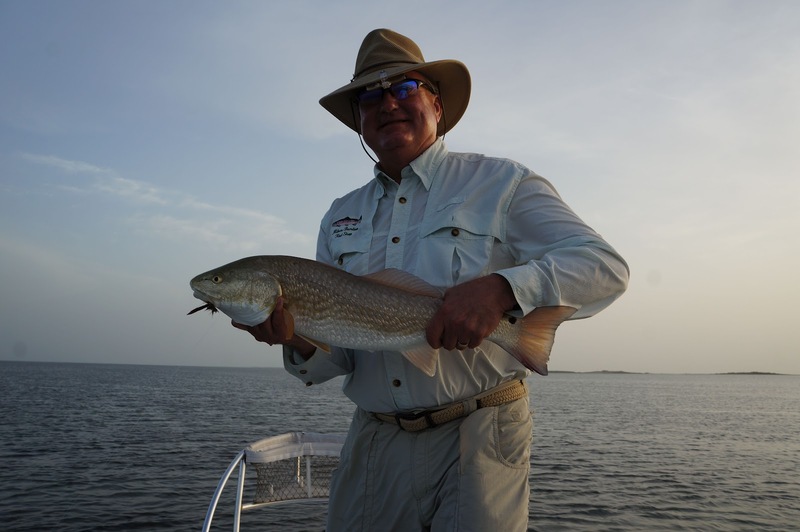 I don't get to see Henry Bone these days, because he's a father of three young kids, and they're more important than a few redfish. But this past weekend, Henry brought a friend, Patrick, who was interested in spending some time aboard a NewWater Stilt before purchasing one. Julie and I went down the Arroyo early Friday evening to launch the boat and get read for the next two days. I picked the guys up well before daybreak, and headed to one of Henry's old haunts. We planed back into the farthest reaches of navigable water and shut down in water that was far less than we needed to get back up in. I was a bit sheepish to have done that our first morning out, but fortunaately, they were eager to wade, so I walked the boat downwind to deeper water while they explored the areas east and west of the boat. Henry missed one red, but it only took 30 minutes to ascertain that the fish were elsewhere, as we should be. 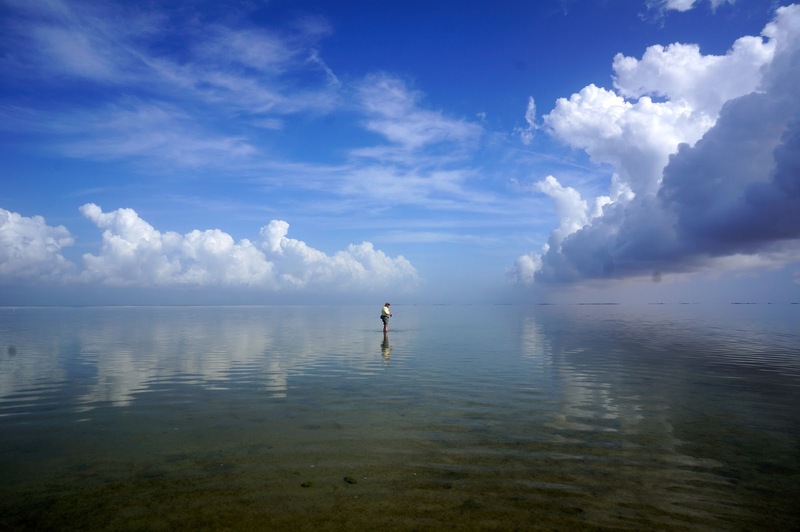 So I got the Stilt up and we headed south into a lagoon that is as pretty as it gets, but often too shallow to hold fish, much less to float a boat. But a combination of moon phase, tropical systems in the Gulf, and the shifting solar tide effect that produces higher tides after early September made for fall-level tides. So we were able to wade into the grassy, clear water that stretched out ahead of us for about 1 1/2 miles. Not a boat interrupted the surface of the shallow expanse. Wading downwind, Henry encountered only a single red, and promptly caught it, while Patrick had hiked way east into water that I rarely fish. He was clearly onto fish, as evidenced by his body language. 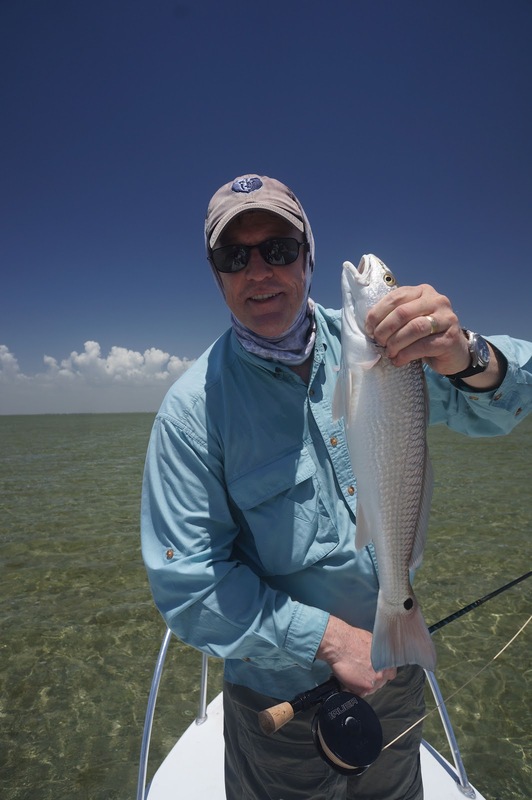 When Henry and I went back to the boat, Patrick ignored us for a while, choosing instead to chase several reds that had left the shoal-grass filled waters of the central lagoon and began feeding head-down on a vegetation free bottom where Patrick could see them 50 yards away. He finally hiked back to the boat and told us what he's seen. I've been off the water for most of August after having spent half the month of July guiding, I'm now gearing up for several weekends in a row, while I teach and do some counseling in between. The last gig on the water was a very fine experience--seven days with a great group of guys, half of whom I'd guided previously. They were based in Port Isabel, but some of them would come to the Arroyo to meet Rick Hartman and me, while one or two would stay in PI to guide with our fellow fly fishing guide, Eric Glass. It was a tough week fishing-wise. The conditions were pretty good--moderate wind in the morning (alas, no dead calm, tailing mornings) and mostly full sun for the rest of the day. With conditions like that, I'd usually predict double-digit days for anyone who can cast 50 feet and see fish. But we had one- and two-fish days all during that time. Rick and I were afraid that Eric was whupping up on us--he's "the man" you know--but he was scratching his head, as well, and calling Rick for information in case he was missing the obvious. But the obvious was the fishing was pretty poor. Even so, there were significant successes over the course of the week, partly due to our group's attitude, which could be boiled down to a single word: gratitude. What a stellar bunch of men, and their faith and their appreciation of the natural beauty of the Lower Laguna came through everything they did. Ultimately, it wasn't about numbers, it was about fellowship with each other and their God. It was an inspiration to be with them. On the first day out, I guided Mike McCoy for the first time in several years. We headed north hoping to find some pods along a shoreline, but as we turned into a back lagoon, I saw birds working over redfish. That's quite a gift in the mid- to late summer, but I didn't complain. I promptly shut down, and found myself 75 yards downwind from 50 tailing redfish, knowing that I couldn't afford to reposition with the motor. It was already too windy to pole upwind to then, and expect Mike to cast into the wind toward them, so I pushed the boat on foot upwind and then turned it downwind to where he could reach the fish. His first cast of his first day of seven days of fishing resulted in an immediate hookup with a 26.5" red. Wow, what a gift! Of course, man anglers would say that a fish on your first cast is bad luck, but I say a 26.5" red on the first cast overrides any subsequent struggle. Knowing Mike, I knew that if he didn't catch a fish for the next six days, he would still be smiling at the end, and remembering that first fish. But the next day, he landed a big trout on the sand, and I got to see that smile again. Indeed, it never went away. 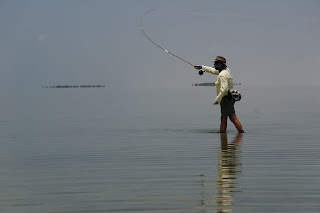 I had a great day with Stan Smart, who uses only bamboo rods on the flats. This is highly unusual, as anyone knows. But Stan has a great cast, and a great angling sense. We waded together on the sand for most of the day, and he did quite well despite the relative absence of fish. I think he caught two nice reds and a couple of ladyfish on his vitage Orvis bamboo rod, and was very happy with that result. Here's a picture of him casting that rod. Stan makes his own bamboo rods from the ground up, but this old Orvis is one that he's repaired twice--hence the large metal ferrules. 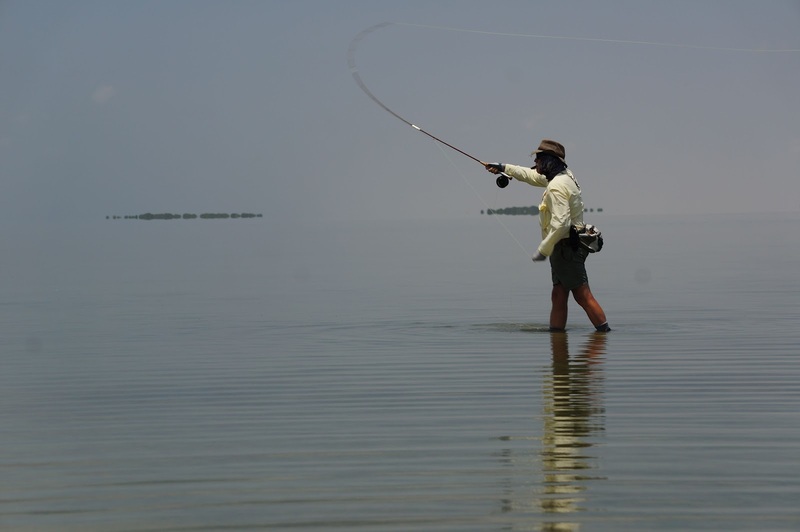 Difficult fishing makes a guide a better guide, because he has to leave the ruts of his day-to-day patterns, and venture into lesser known, or nearly forgotten venues. The thing to avoid is desperation, because you will go so far out of your comfort zone that you might put yourself or your clients at risk. Indeed, one day 10 years ago I guided an 80-year old man, who probably should have been spin fishing. I tried so hard to help him succeed that he hooked me, I broke my push pole, and I lost my anchor before the day was over. A sign of "losing one's center." I rarely do that anymore, because when I guide, I am confident that regardless of the conditions, I am "tapped in" sufficiently to make good decisions on the basis of years of experience. I don't take it personally any longer. Anyway, Rick and I both found some surprises along the way. 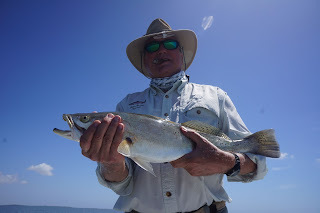 He found some big trout that were hanging in pot holes near the Intracoastal, and toward the end of the week, helped his clients land a few 24" trout. I, in turn, found some big reds congregated in a back lagoon that occupied my clients for the last two days of our time together. Mike's son Andy, who had only two days with the group, hooked a 30+" red and fought it for quite a while before the fly popped out. Landing that fish would have made anyone happy, but merely hooking it and fighting it made Andy, whose personality is very much like his father's, appreciative. Later that same day, he and I were wading near the East Cut and came upon a 20+ pound black drum in shin-deep water with his back out. Having had clients catch these behemoths, I was confident that Andy could catch the fish with an "in-his-face" presentation, and a bit of luck, but alas it wasn't in the cards, even though Andy did what he needed to do. We had a great week together, and I sincerely look forward to guiding these men again--Tracey Dean, Mike McCoy, Stan Smart, Andy, Dennis Raines, and Dan--all the kind of anglers and men you'd like to call your friends.